Although Russia may think last week's official report on the crash in Smolensk that killed President Lech Kaczyński put the matter to rest, in Poland it only fanned the flames of debate. Last week, the Russian Interstate Aviation Committee (MAK) delivered a report on the fatal crash of the Polish TU-154M plane near Smolensk Severnyi airport on April 10, 2010. The Polish government plane hit trees and crashed while attempting to land in dense fog, killing all 96 people aboard, including President Lech Kaczyński and his wife Maria and several top political and military figures. The crash has since thrown Poland’s political life very much off balance. While MAK is saying that the report ends the investigation, in Poland it has only fanned the flames of the debate. In this year of Polish parliamentary elections, the Smolensk tragedy is likely to obscure all other issues—such as the economy or the country’s financial situation. The MAK report pointed to pilots’ mistakes, committed in an atmosphere of substantial psychological pressure to land from the important people aboard. Additionally, the conditions at the Smolensk Severnyi airport ruled out the touchdown; there was virtually no visibility due to a dense fog covering the airport. In Poland, the presentation of the MAK report in Moscow was greeted with skepticism at the very least, revealing deep fault lines between the coalition government, led by the Civic Platform (PO) party, and the chief opposition party, Law and Justice (PiS). 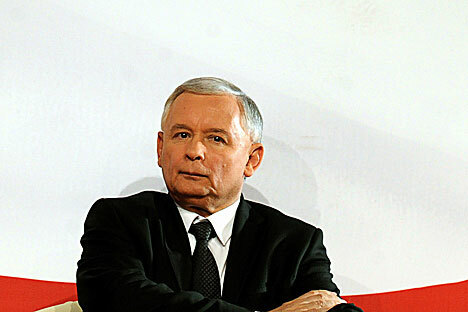 PiS chairman, Jarosław Kaczyński, is the twin brother of the late president. Having lost its leader and several members of the parliament in the crash, investigating the Smolensk tragedy has become a leitmotif of PiS activity since the day of the catastrophe. PiS has been encouraging the investigation while at the same time suggesting that the blame should rest with Russia and the PO government. Jarosław Kaczyński called the MAK report a piece of “Russian propaganda,” dismissing arguments that it was mistakes on the Polish side and the pressure on pilots to land that led to the tragedy in the first place. PiS also disagrees with the Polish government’s agreement to base the investigation on the Chicago convention, which allowed Russia to take full control of the inquiry. Joanna Fotyga, Jarosław Kaczyński’s aide and a former Polish minister of foreign affairs, said that Polish Prime Minister Donald Tusk was working “on the orders of Sergei Lavrov,” the Russian minister of foreign affairs. Trying to maintain its calm, the PO government has kept insisting that the goal of the investigation was to meticulously analyze the causes of the crash. “The work should be on identifying why the crash happened without weighing the blame. We shouldn’t try to blame Russians and disregard our own faults,” Miller said in the Polish parliament on Jan. 18. “The facts are, the bulk of the causes of the crash is on the Polish side. We should accept the truth, no matter how difficult it is,” he added. That said, Prime Minister Tusk told journalists last week that the MAK report was “incomplete.” The Polish government pointed to the fact that the MAK report didn’t contain anything about the work of air traffic control at the Smolensk airport. To back up their claims, Poland presented recordings from the air control at the Severnyi airport. “The recordings reveal many mistakes made by the Russian side,” Interior Minister Jerzy Miller, who heads the Polish commission investigating the crash, told journalists at a press conference on Jan. 18. Among key mistakes, according to the Miller commission, was misleading information from air control about the plane’s position as it was descending, as well as a slow reaction to the low level of the plane in the air. The key command, “horizon,” which means to circle around the landing site again, came 11 seconds too late, according to the Miller commission. MAK reacted to Poland’s release of the recordings by publishing a full record of what was going in the air traffic control at the Severnyi airport, as well as the calls and radio conversations of involved officials. The discussion of the Smolensk tragedy and the Russian and Polish attempts to investigate it is only bound to increase over the course of the year, especially as the anniversary of the tragedy approaches. A missing element from the debate between the government and the opposition seems to be what aviation experts – former pilots among them – have to say. And the experts’ voice is almost unanimous: Regardless of what the Smolensk air traffic control did, no pilot should have attempted to land in the weather conditions that occurred over Smoleńsk Severnyi airport on April 10, 2010. “Air traffic control could have obsolete equipment, be under pressure from Moscow not to deny Polish president the landing, but the ultimate decision is on the pilot. Who sat behind the control yoke, after all, the air traffic controllers or the pilots?” is a rhetorical question heard most often.